Signed and dated u.r. verso, black crayon "Alan Davie JUN. 57". 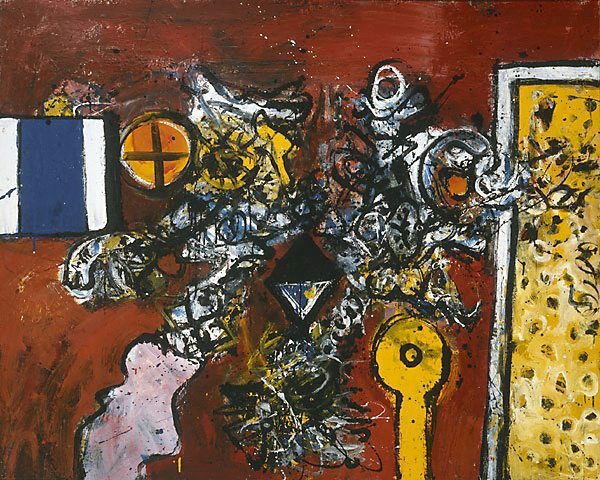 Alan Davie, Purchased by the AGNSW from the artist 1959. Purchased from the exhibition 'Recent paintings by seven British artists' Australian State Galleries 1959. Hector Gilliland, Art and Australia (Vol. 19, No. 3) , 'Artist's choice No. 10: Alan Davie: Flag dream No. 4: Wheel', pg. 318-319, Sydney, Autumn 1982, 318, 319 (colour illus. ), 320. Laurie Thomas, The Sun , 'Freer trend seen, Abstract art from U.K.', Sydney, 17 Mar 1959. Art Gallery of New South Wales picturebook , Sydney, 1972, 60 (colour illus.). The Sydney Morning Herald , 'Abstracts from Britain at the N.S.W. Gallery', Sydney, 17 Mar 1959. Art Gallery of New South Wales catalogue of British paintings , Sydney, 1987, 46 (illus.). When art hits the headlines: a survey of controversial art in New Zealand , Wellington, 1987.